The key problem in the Brexit deal remains what to do with the Irish border. 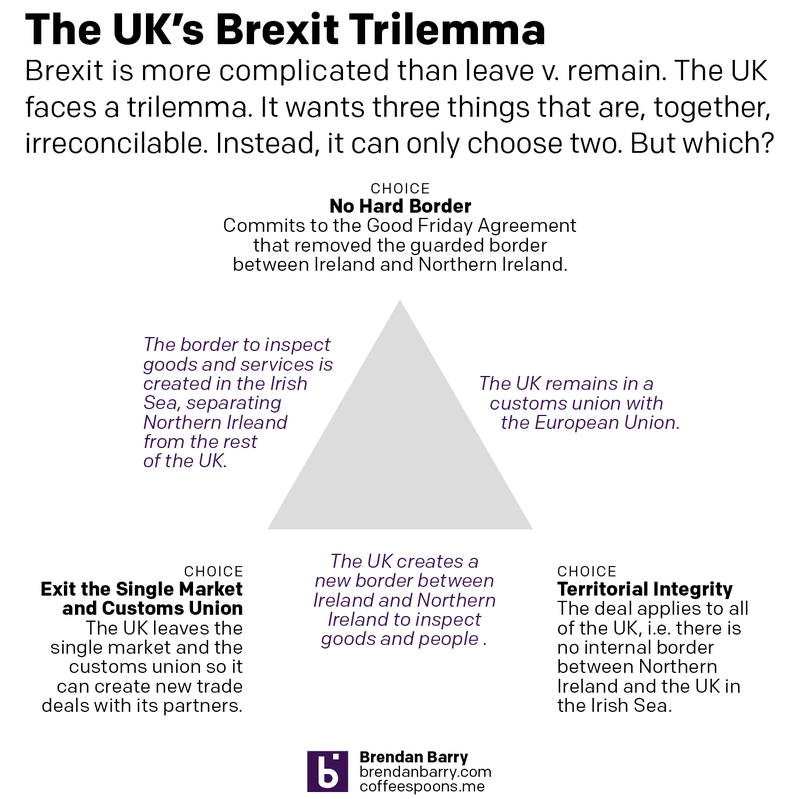 In essence, the UK faces the same trilemma it has since the beginning. It wants three things it cannot have at the same time: exiting the EU single market and customs union, so it can create a free and independent trade policy; no hard border between Ireland and Northern Ireland, per the Good Friday Agreement that ended the Troubles; and territorial integrity, i.e. no hard border between Northern Ireland and the rest of the UK in the Irish Sea. Essentially, the UK can choose two of these three options. Below, I have attempted to show how they relate and what the result is once two of the options have been chosen. Choose two and only two. Credit for the piece is mine. 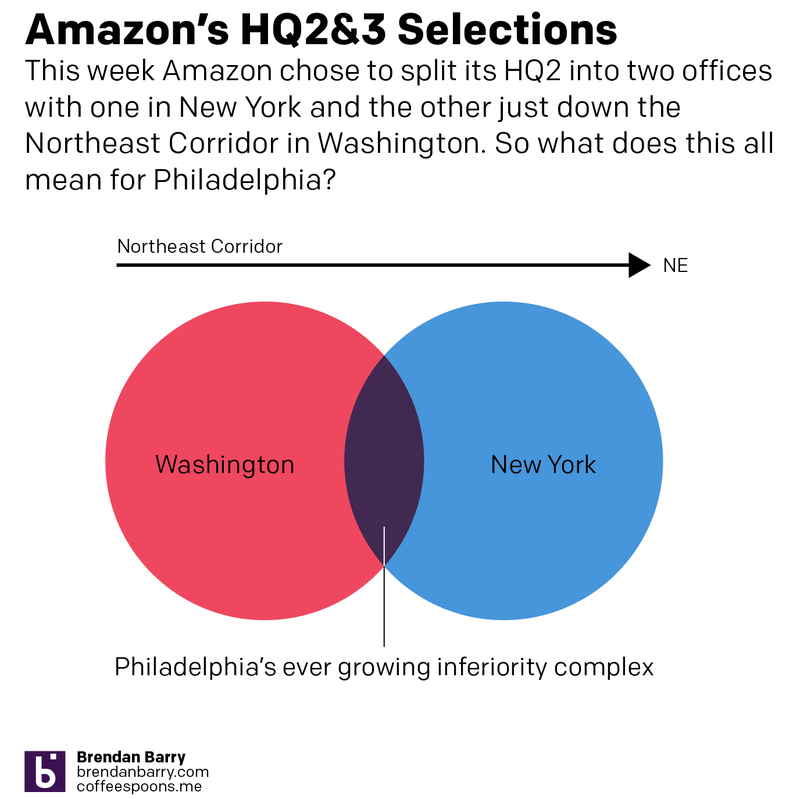 Well this week Amazon finally chose not just one city for its HQ2, but two—New York and Washington. Of course Philadelphia had been angling for the site. Alas, it was not to be. So let’s work with that for this Friday post. Credit for this one is mine. The only number you need today, the only factette you need to see today, is this. 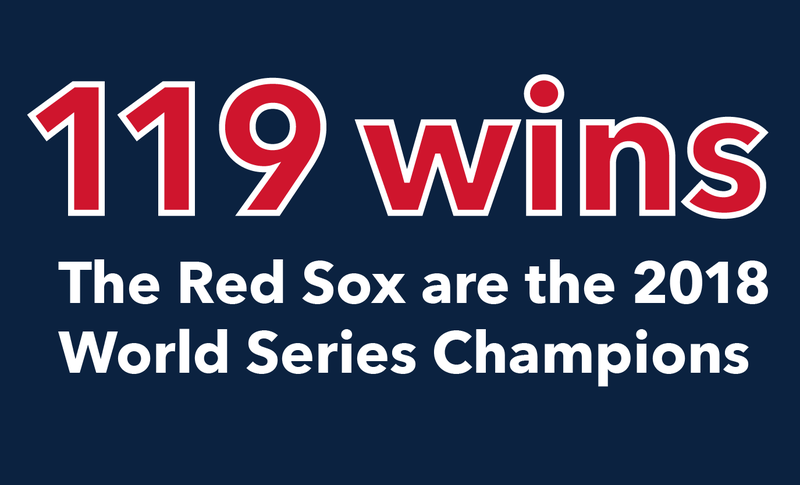 Well done, Boston. Well done. Sweden went to the polls this past weekend and the results are mostly in, with overseas ballots left to be counted. But the results are clear, a stark rise for the nationalist Sweden Democrats, though not as high as some had feared late last week. It does a good job of showing the parties and how they are laid out, though I am sometimes more partial to a straight-up bar chart like below at Reuters. Here the Sweden Democrats are grey. However, both do not do a great job in showing what would traditionally be a kingmaker result for Sweden Democrats. 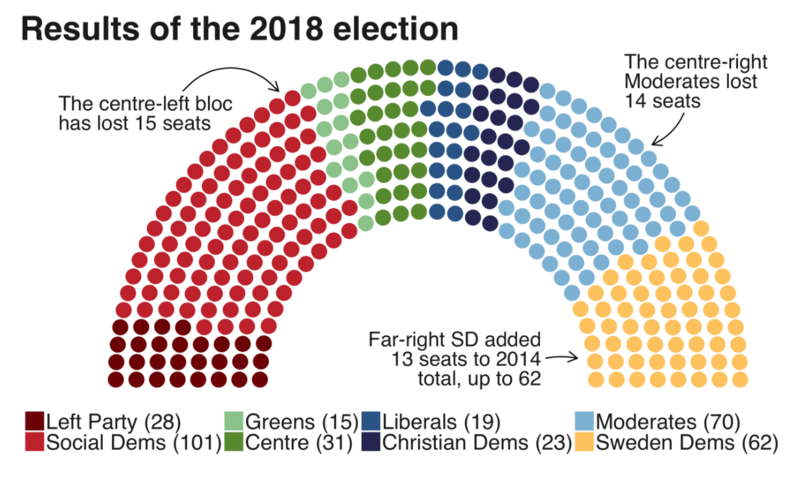 When stacked at each end, neither the centre-left bloc, led by the Social Democrats, nor the centre-right, led by the Moderates, are in control of a majority of seats in the Riksdag. Imagine that neutral colour straddling a 50% benchmark line or sitting in the middle of the seats. It makes it far clearer just how pivotal the Sweden Democrats would usually be. 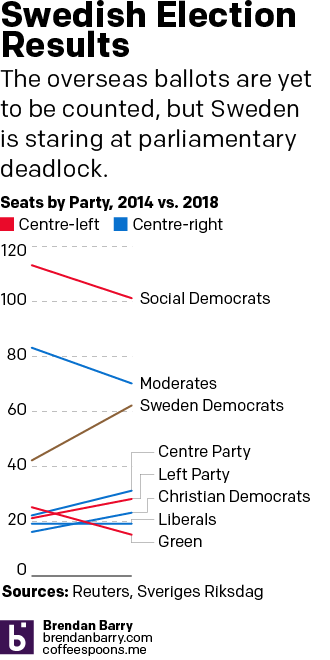 Because, usually, Sweden Democrats or parties like it—in the sense of it won a large number of seats—that help the main coalition cross that 50% threshold would have an enormous sway in the next governing coalition. But here, the Sweden Democrats are an anti-immigrant, nationalist party that both the centre-left and centre-right have said with whom they will not enter talks. Here the Sweden Democrats are brown. But graphically, the thing I always find lacking in charts like those above are just how dramatic the rise of the Sweden Democrats has been. And so for that, we have this little piece of mine that complements the two. Because not all members of the coalitions experienced the declines of their major parties, the Social Democrats and the Moderates. In fact, with the exception of the Green Party, all others rose or, in the case of the Liberals, stayed flat. A more thorough defeat would have probably seen the whole of the coalition falling in the number of seats. Unfortunately for Sweden, in this case, the nationalists took the lion share of the seats lost by the top two parties. Credit for the BBC piece is mine. Credit for my work is mine. There is nothing super sophisticated in these charts, but I love them all the same. The Economist Intelligence Unit (EIU) published its rankings of the world’s most liveable cities and this year Vienna knocked off Melbourne for top spot. But what about the rest of the list? 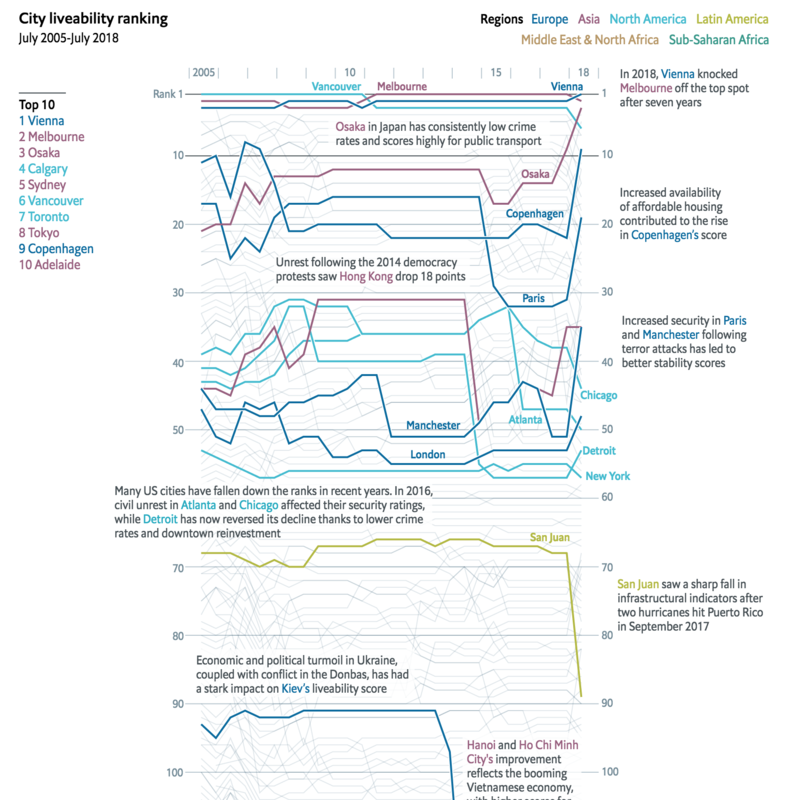 Thankfully the Economist, a related company, put together a graphic highlighting important or noteworthy cities among the entire dataset. It is a wonderful tangle of light grey lines that have select cities highlighted in thicker strokes and brighter colours. Labelling each city would be too tricky at this scale. 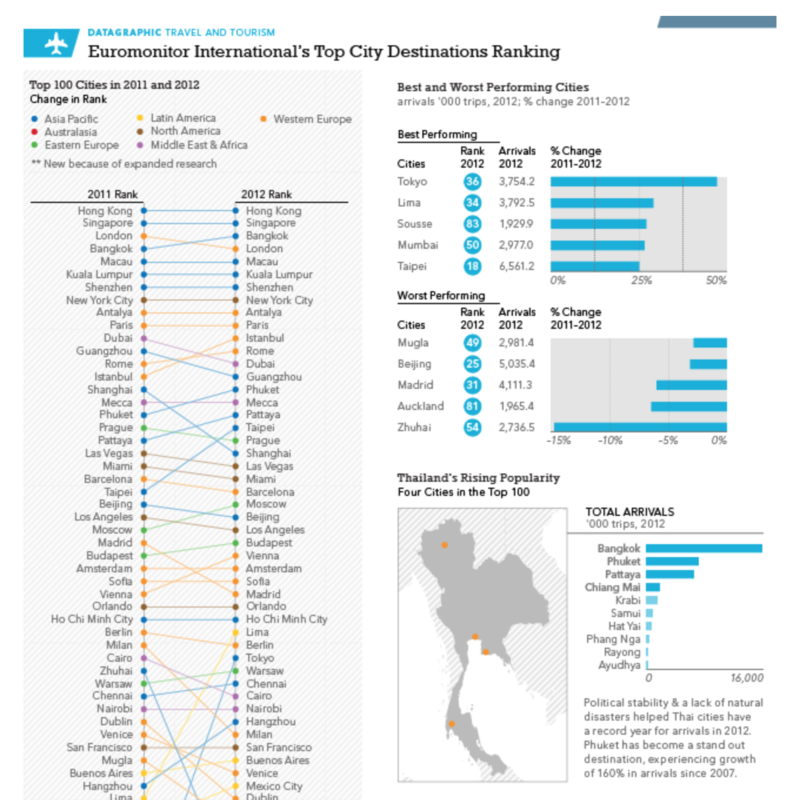 I’m okay with the occasional rainbow spaghettiThat said about labelling each city, a few years back I worked on a similar top cities in a category datagraphic for Euromonitor International. We took a similar approach and coloured lines by region, but we presented the entire dataset and then complemented it by some additional charts to the side. What is really nice about the Economist piece, however, is that they opted not to show the whole dataset. This could be a business decision, if people want to find where a particular city they could be persuaded to either outright subscribe or otherwise provide contact information in exchange for access to the data. Either way, the result is a piece that has space to provide textual context about why cities rose or fell over the years. I think I like these types of pieces because there is so much to glean from getting lost in the chart. And this one from the Economist does not disappoint. Credit for the liveability piece goes to the Economist Data Team. Credit for the destinations piece goes to me. Last week parts of Ohio voted for a special election in the 12th Congressional District. Historically it has been a solidly Republican district by margins in the double digits. However, last week Republicans barely managed to hold the seat by, at the latest count I saw, less than one percentage point. Why? Well, it turns out that Republican support is bleeding away from one of the traditional strongholds: suburban counties. I saw this data set late last week on Politico and I knew instinctively that it needed to be presented in another form than a table. Consequently I sketched out how it could work as small multiples of area charts to highlight just how Republican the district is. This is the digitisation of that take. Unfortunately my original sketch also featured a map of the district to show how this falls to the north and east of the city of Columbus. But I did not have time for that. Instead, I sketched up something else, but I need time to work on that. So for now, this concept will have to suffice. A week and a half ago my favourite band, Radiohead, played two shows in Philadelphia to close out their 2018 North America tour. I got to see the final of the two shows. And I decided to make this little piece over the weekend. Because it was totally fantastic. 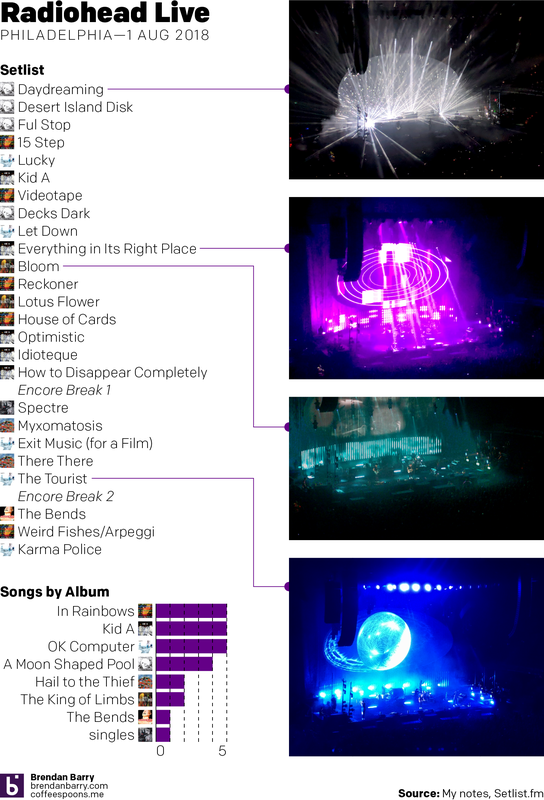 The data shows that the band played a good mix of songs from across their discography. Admittedly they played nothing from Pablo Honey, but with the exception of Creep and Anyone Can Play Guitar along with some of the era’s b-sides, I really do not listen to that album all that often. They also skipped over Amnesiac, but did play five songs from my favourite album, Kid A, so, yeah, again, totally fantastic. Especially those final three songs to close the main setlist. Just brilliant. Credit for this work is mine. Late last week we heard a lot about contributions to NATO. Except, that was not true. Because the idea of spending 2% of GDP on NATO is actually about a NATO member spending 2% of its GDP on its military. And within that 2%, at least 20% must be spent on hardware or R&D. There is a separate operating budget to which countries actually contribute funds. But before we look at all of this as a whole, I wanted to explore the burden sharing, which is what NATO terms the 2% of GDP defence expenditures. I did something similar a couple of years ago back in 2014 during the height of the Russia–Ukraine crisis. However, here I looked at a narrower data set from 2011 to 2018 and then across all the NATO members. In 2014, NATO met in Wales and agreed that over the next ten years all members would increase their defence spending to 2% of GDP. We are only four years into that ten year plan and so most of these countries still have time to reach that level. 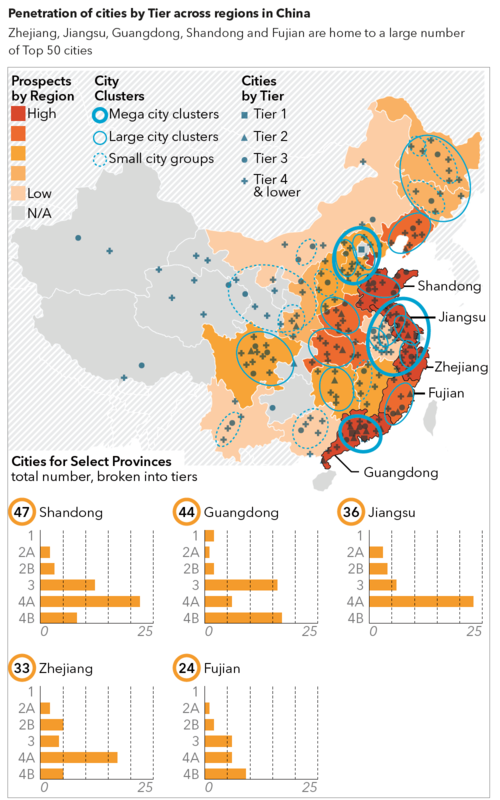 Yesterday the Economist posted a graphic about Chinese urban clusters, of which the Chinese government is planning to create 19 as part of a development strategy. In terms of design, though, I saw it and said, “I remember doing something like that several years ago”. 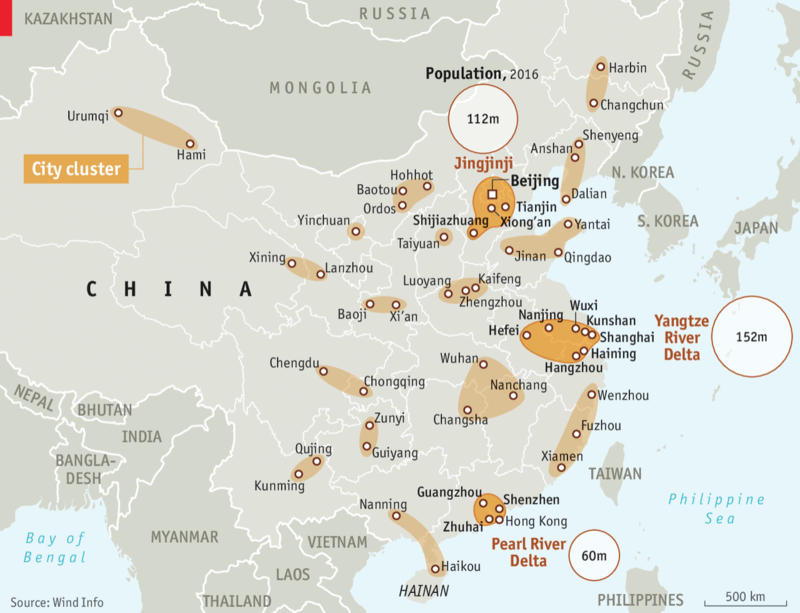 The Economist piece looks at just the geography of the Chinese clusters. It highlights three in particular it discusses within the article while providing population numbers for those clusters. Spoiler: they are large. The Economist graphic does little else beyond labelling the cities and the highlighting of the three features clusters. But that is perfectly okay, because that was probably all the graphic was required to do. I am actually impressed that they were able to label every city on the map. As you will see, we quickly abandoned that design idea. So back in 2015, using 2014 data, my team worked on a series of graphics for a Euromonitor International white paper on Chinese cities. The clusters that the analysts identified, however, were just that, ones identified by researchers. Since the Chinese government had not yet created this new plan. We also looked at more cities and added some vital context to the cluster map by working to identify the prospects of the various Chinese provinces. Don’t ask me what went into that metric, though, since I forget. The challenge, however, was identifying the four different tiers of Chinese city and then differentiating between the three different cluster types while overlaying that on a choropleth. Then we added a series of small multiples to show how now all provinces are alike despite having similar numbers of cities. Credit for the Economist piece goes to the Economist Data Team. Credit for the Euromonitor piece is mine. I would gladly give a shoutout to those that worked with me on that project…but it’s been so long I forget. But I’m almost certain both Lindsey Tom and Ciana Frenze helped out, if not on that graphic, on other parts of the project. Unless you avoid the news, we all heard a lot about tariffs this weekend. So this morning, instead of going with some other things I found, I decided I wanted to look and see just what the data is on tariffs. Turns out Trump is wrong on the data about tariffs. In short, in 2016 the US had a slightly higher average tariff for all products at 1.61%. The EU was at 1.6%. And the Canadians? They charged an outrageous 0.8%. The data comes from the World Bank. And over breakfast, I did not really have the time to clean this graphic up, so it shows the whole world. Though it goes to show you, the western countries against which Trump raged this weekend generally have low tariffs, some lower than what the US.